An act of opening implies that there is a form, which has to be opened up in order to optimally reveal its inner character. The opening provides the opportunity to enter the form. The act can be seen as a movement through the spatio temporal borders of the form. Combined they provide the opportunity for transitioning from an outside state of being to an inside state of being. 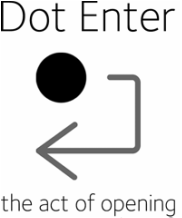 Dot Enter explores the act of opening itself. Questioning the character of the to be opened form, deconstructing the apparent border, searching for different entries, moving from one perspective on the act to the other. And seeks to portray coexisting visions on the traditional act of opening. Ten top talents from five different conservatories around the world joined together to officially open the 5th IMC World Forum on Music in Brisbane. The musicians worked with directors Gosse de Kort and Vanessa Tomlinson during an intense workshop to develop ideas and concepts before focusing their attention on-site to re-arrange, compose and edit the material according to the space where the piece will be presented. For this dedicated, one-off, open-air opening performance, the musicians used the stages, stairs, balconies and terraces of the Parklands entrance of Queensland Conservatorium as their stage. Frans de Ruiter, Huib Schippers, Danielle Bentley, Helen Lancaster, Saba Issa, Ralph Collins, Liz John, ABC radio, Security department Griffith and South Bank Brisbane. And all others for thinking with us and for making this beautiful project possible! With additional support from the Leiden Academy of Performing and Creative Arts and Royal Conservatoire, The Hague.